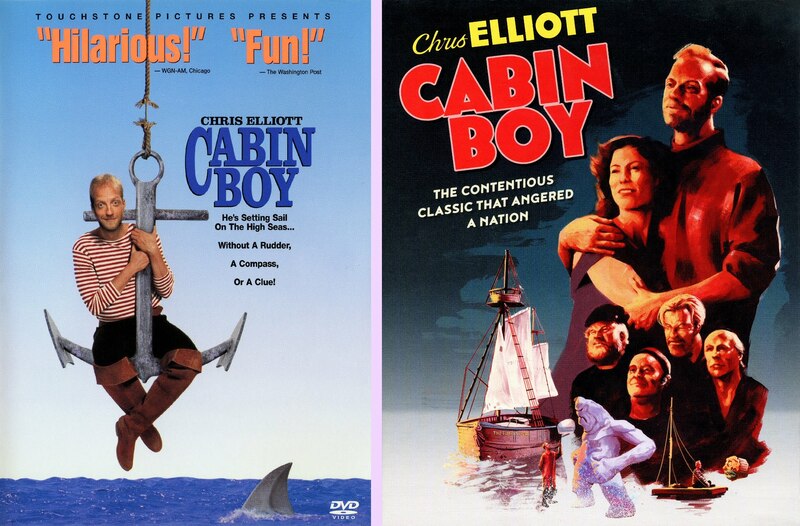 Most people would probably think I was being ironic to say this, but I have been waiting for a Cabin Boy special edition since the days of laserdisc. I know it's an infamous flop (and if you weren't totally keyed into that, the self-flagellating filmmakers really wallow in it for you here), but it's such a weird, unique and - at least at times - genuinely funny comedy. More than that, it's a strangely creative endeavor full of artful visuals and varied special effects, it's just crying out for behind the scenes footage and interviews with the cast and crew who made it happen. And this week, Kino have finally and surprisingly, made it happen. 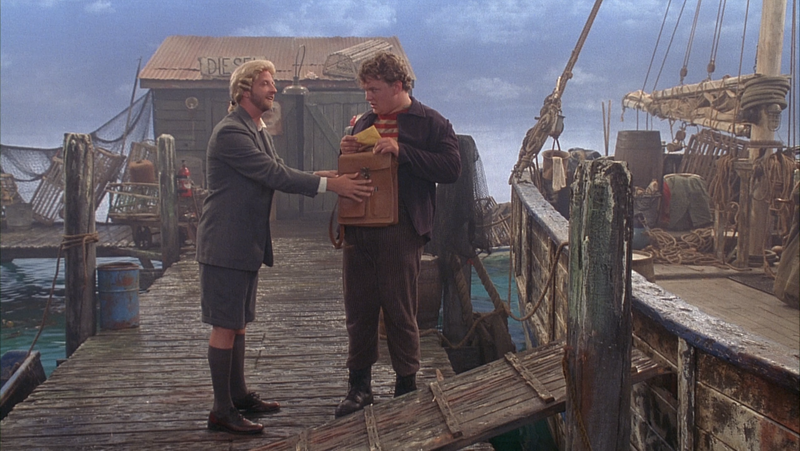 If you're not familiar, Cabin Boy is a bizarre clashing of worlds. Somehow, Tim Burton who was nearing his creative and commercial peak got his chocolate mixed up with Chris Elliot (David Letterman's it boy in the 80s)'s peanut butter. So you wind up with surrealist, fantastic imagery and sarcastic meta comedy all in the trappings of a homage to classic Hollywood cinema. In fact, the filmmakers and press materials all keep talking about how this is a film in the vein of early sea voyage films "like" Captains Courageous (the 1937 Rudyard Kipling yarn starring Spencer Tracey), but in fact this is largely a near perfect one-to-one parody of Captains Courageous, at least until it spills over into the Harryhausen Sinbad universe for its second half. 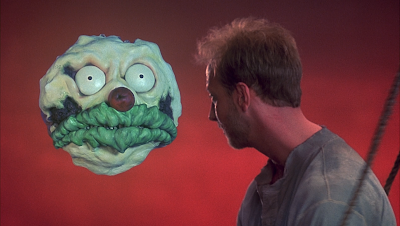 So you've got attractive but deliberately unreal sets with painted backdrops and even stop motion creatures paired up with David Letterman in a rare cinematic cameo hawking televisions and sock monkeys. And that's probably the source of this film's troubles. Who, out of the demographic for a Chris Elliot movie in 1994, was apt to have seen Captains Courageous? 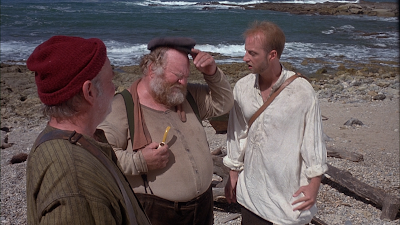 Because, for anyone who's been baffled by Cabin Boy, watching Captains Courageous is like discovering the code book. Scene after scene is directly making fun of identical moments in the original. Spoiled little rich kid thinking he's on the Queen Anne when he's really on a rustic fishing boat, and demanding the captain sail him home. The rival cabin boy, having to cut off the fish heads, spending a night on deck with the captain as he sings his sea chantey. Even the ridiculous costume with the shorts and knee socks. Elliot is often (and not incorrectly) criticized for how unlikable his character is, but it all comes together when you realize he's doing that character. It's like expecting kids who've never seen James Cagney to laugh at your "you dirty rat..." impression. 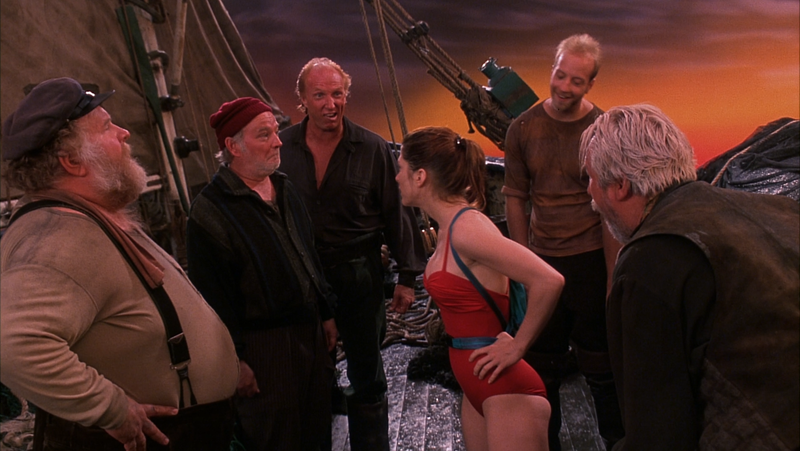 I'm sure it also doesn't help that Tim Burton was originally supposed to direct this, but he decided to give it to Elliot's writing partner Adam Resnick, who'd never directed a film before (or since), instead. It never occurred to me until seeing the extras, but it makes perfect sense. 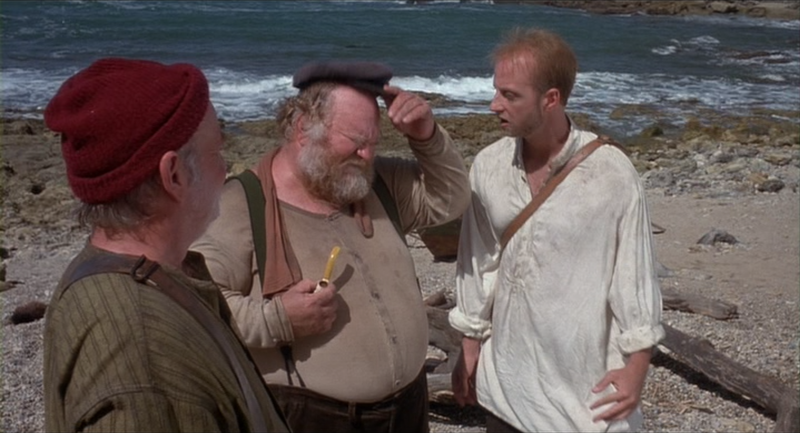 This was supposed to do for Chris Elliot what Pee Wee's Big Adventure did for Herman. A star vehicle but packed with so many of Burton's wacky creations the film would be a delight that carry him over to more mainstream audiences. Then obviously that didn't happen. 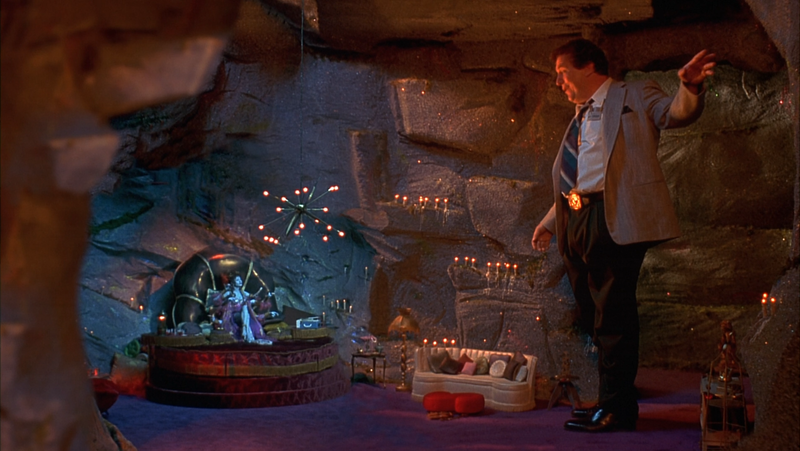 But there's still a lot to delight in if you go into this picture with an open mind, including a lot of charming fantasy, some great sarcastic humor, and a perfect supporting cast including the comedy debut of Andy Richter, Brion James, Brian-Doyle Murphy, Bob Elliot (of course! ), James Gammon, Twin Peaks' Russ Tamblyn, an uncredited Alfred Molina and Ricki Lake as the ship's masthead. YMWV regarding whether Cabin Boy is a lost gem or an interesting failure; but at worst, it's a damned interesting failure that deserves to have documentaries made about it. 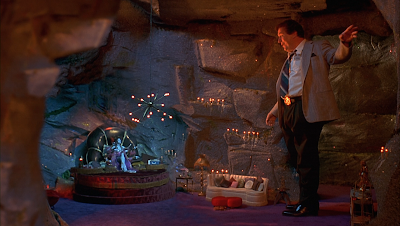 I was bummed when the laserdisc turned out to be barebones, and again when the 2002 Touchstone/ Buena Vista DVD was. 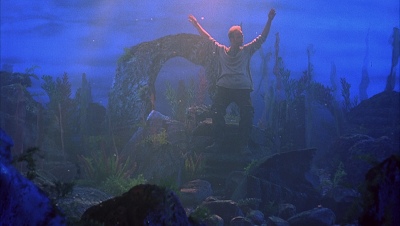 But at least it was anamorphic widescreen. 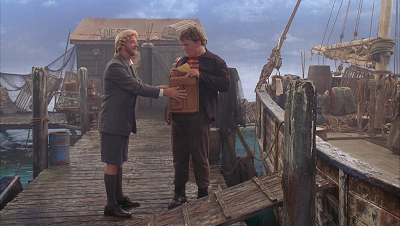 Cabin Boy may've been a dumb comedy, but it's definitely not one where you can say the visual presentation doesn't matter. But now, this Fall, Kino Lorber has finally given us fancy lads what we've always wanted, an actual special edition, on a very attractive, high quality blu as part of their Studio Classics line. 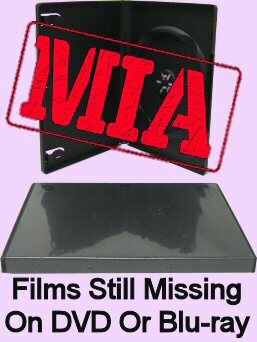 2002 Buena Vista DVD on top; 2018 Kino blu-ray bottom. So, the biggest plus is definitely how the blu cleans up the progression. Obviously, that's how SD to HD works, but it just looks so much cleaner on the blu. This is no fancy new 4k scan, grain is not particularly resolved at all, and you can tell the transfers have been taken from the same source. Dirt and damage is very rare on either disc, but it is there. Look at the first set of shots. See that black mark that pops up for that single frame on Chris's chin? It's very clear on the blu, but almost invisible on the DVD. 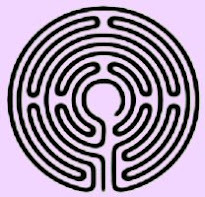 Yet it is there if you look close enough. It's just that the DVD artifacts the small details so much, it almost erases it. Of course, that's not such a big loss when it comes to dirt and debris, but when the DVD does that to the natural detail of the film, it's not so cool. So the blu is decidedly clearer. In addition to that, the aspect ratio's changed. 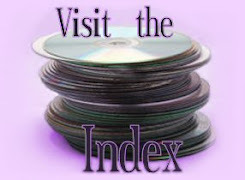 The DVD is slightly matted to 1.85:1. Kino opens it up to 1.78:1, not just revealing the info under those mattes, but also zooming out a bit further to show a bit more along all four sides. Otherwise, the color timing and everything is the same. Again, we're talking about the same source, and things are still a bit squishy when you really zoom in; but thankfully free of edge enhancement or other tinkering that often plagues older masters. It's the kind of blu that would've gotten higher marks in the earlier days of HD, but now that we're used to 2 and 4k restorations, it's not as impressive. Still, it's a solid, attractive blu that definitely warrants replacing your DVD. Audio-wise, both discs feature the original Dolby stereo mix, though the blu bumps it up to uncompressed DTS-HD. Both discs also include optional English subtitles. Of course, I mentioned a warranted upgrade from the DVD based on the PQ, but I'm sure most fans will really be excited for the extras. The DVD had nothing, not even the trailer; it was as barebones as you could get. The blu-ray, on the other hand, has a lot. Let's start with the audio commentary. Chris Elliot and Adam Resnick have some good memories but are very critical of their own work, here. They're joined by a very enthusiastic moderator who argues the case for this being a big cult hit comedy, but they don't seem to be buying it. It's a good commentary, despite a few pauses of dead air, but they then have a joint 45-minute on-camera interview, which is even better. They talk about everything from how they met, their days with Letterman and working on Get a Life to pitching this project to Tim Burton and how it wrecked their careers afterwards. They're very forthcoming, as opposed to those standard promotional interviews where all they can say is how everyone was so brilliant. Then, there's a bunch of vintage materials. There's about eight minutes of promotional interviews, which are good just because we get to hear from most of the rest of the cast. They're so short, though, you'll be wishing for each of them to get more in depth. But they're better than nothing. More interesting are the outtakes and audition footage, only about six minutes each. But the best part about them is that they also double as deleted scenes, showing us scenes and dialogue that aren't in the final cut of the film. Resnick and Elliot bemoan some of the stuff they had to cut once the studio lost faith in their film and wanted it to be as short and fast-paced as possible, so it's nice to see a little bit of that. There's also some B-roll footage, which is great because it mostly documents exactly the kind of big special effect sequences I mentioned always wanting in the opening paragraph. 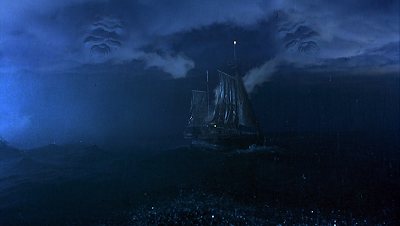 There are some great shots of Elliot and Tamblyn battling the upper torso of the island giant. We also do get that trailer, finally, as well as five(!) TV spots. And Kino presents this blu with fabulous reversible cover art, a fancy slipcover, and a twelve page booklet with notes by critic Nick Pinkerton. 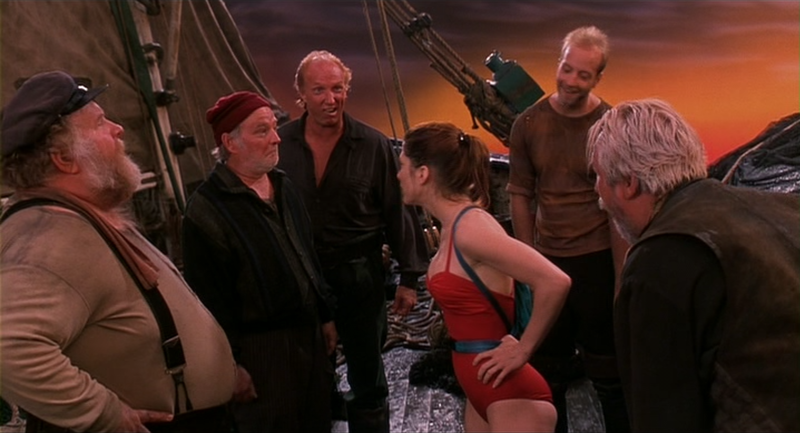 I have to say, I never would've picked up on the opening of Cabin Boy being a play on Empire Of the Sun if I hadn't read that. So obviously, if you're a Chris Elliot fan, you've already had this pre-ordered all summer. 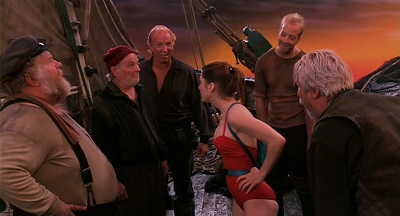 But even if you aren't, and maybe even have not-so fond memories of Cabin Boy from the 90s, I think this one's worth another look. For Tim Burton fans, the special feature stories behind the film may be more essential than the movie itself. And for cinephiles in general, there's at least a lot of museum-like call backs to film history to gawk at, not to mention such a colorful assortment of character actors. Objectively, this is a film that should never have gotten greenlit; it never stood a chance of being what anyone involved in its creation wanted it to be. But I, for one, am pleased to see it continue to find a way to live on. Hell yeah! 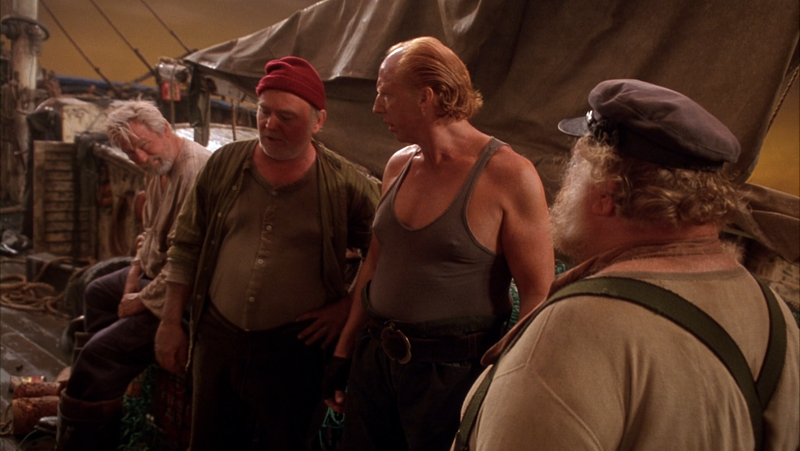 Cabin Boy still plays pretty regularly on Showtime; it lives on! Now we need a special edition of Clifford, another one of those strange, misguided star vehicles that could only have come from the early-90's.